You are here: Home / Career / Are you faster than 300? You could save hours of time each week if you were. Are you faster than 300? You could save hours of time each week if you were. Following up on last month’s “bite-sized professional development” blog focusing on how TED Talks are inexpensive and “bite-sized,” typically about 15 minutes, this month I want to talk about reading. Primarily books, but also professional journals, and magazines / articles, in our profession and outside of our profession. Staying up to date in career development is a key piece to raising your credibility and the credibility of the entire career profession. I try to have at least one or two ‘professional’ books waiting for me either on my shelf or on my Kindle reader. My current two books are, The Couple’s Retirement Puzzle by Mintzner and Taylor; Callings. By Gregg Levoy (Yeah, I know this has been around for awhile, I’ve just never read it). I also have pleasure reading books that I mix in between the professional readings. I can’t wait to start reading Jeff Shaara’s book, A Blaze of Glory. Challenge yourself to grow, to think differently by reading different views, to try and understand others, especially if you don’t agree with them, and learn something new. 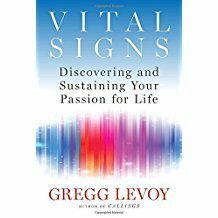 What is your book goal? Books are not the only place we should be reading. There are many great career oriented journals or magazines through a wide variety professional associations, both online e-magazines and paper versions. Here are a few of my favorites. Career Convergence, their e-magazine. Articles are mostly under 950 words. Fairly quick reads and broken into constituents groups (3 minutes for the average person). You can search by various constituent groups as well. Here is my recent Independent Practice articles on Using Social Media. Check out your constituent group while you are there. Career Developments, is a hard copy quarterly journal for members only. Most articles are around 1200 words. (4 minutes for the average person). Check out one of my favorite articles I wrote a few years ago comparing academic advisors (and career advisors) to the Wizard of Oz. Quarterly e-journal focusing on working with Boomers. Average length about 1000 words (3-4 minutes). As you can see, these are really not a huge commitment of time… you just need to take the time. *I also encourage you to read OUTSIDE of our profession. I like to browse in bookstores at a variety of different magazines, like Inc. or Backpacker or Time etc… and flip through to see any articles of interest. This is my “intentional serendipity” approach to discovering something by accident. It is good to see what people outside our profession are writing about careers. What is your journal goal? My third reading platform is blogs. These I try to read a little bit each day. 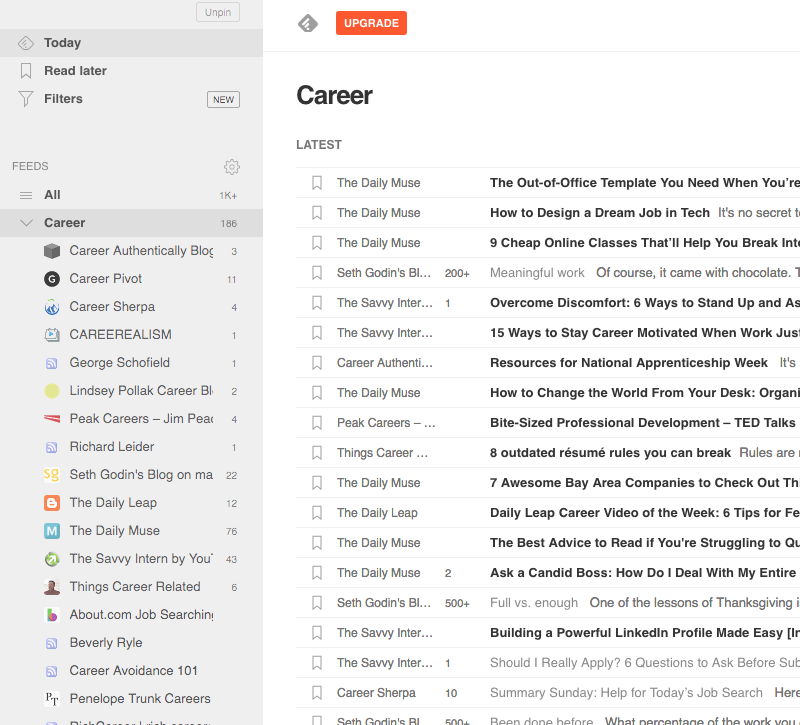 I use Feedly.com to consolidate all my favorite blogs. I organize it by “Career” and also by “News”. I can quickly scan the titles of all the recent blogs in each category. See screenshot below of my ‘feedly’ stream. You can see how easy it is to look for interesting articles quickly. My blog goal: Read a little bit every day, but Monday is my big blog day. What is your blog goal? As a career professional, it is important that we find time in our busy lives to continue learning. Reading is just one way that we can continue to grow, learn, and expand our thinking. Challenge yourself to find time weekly in whatever way you can to be a better career practitioner so you can serve your students / clients in the best way possible. Note: Skimming articles at 400 words can be just as good as reading them at 250-300. It really is about finding the time.